Musical genres can be a tricky thing to define these days and yet we all somehow feel the need to slice and dice music, to compartmentalize songs, to put them in neatly titled boxes. Matt Drenik's latest (and greatest) musical incarnation Battleme is hard to put in one box. On the "Weight On The Brain" EP (which is a teaser of an upcoming full length album due out early next year) he conjures up potent rock songs dressed up with lush power chords and clean production. That super chunky rock sound along with a heavy, heavy tone of dreaminess as in stepping into a dreamland makes me think of bands like Spacehog, Silverchair, Smashing Pumpkins, Wires on Fire and even Dream Theater. Most of these bands shined brightest in that mid 80's to mid 2000 time frame so when you listen to Battleme there is a certain sense of nostalgia and I mean that in a good way. From the first feedback laden chords of Just Weight- the dreamy majesty almost makes you feel like you are floating inches off the ground. 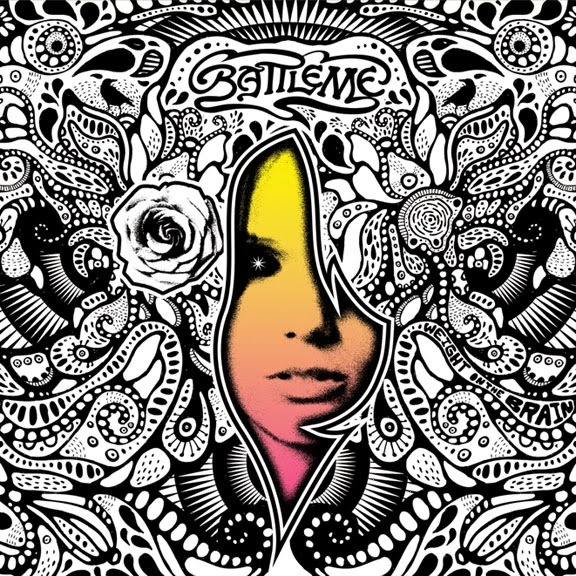 While you might generalize that a lot of punk and indie rock has a cynical edge, Battleme's sound has this glammy enchanting side to it. I Know moves in such a way that the rock fury chases itself. It has an appropriate rock lead that you don't hear a lot of any more. Cobweb Portrait with it's down tempo feel and big sweeping guitar breaks that give way to spartan piano and vocals is a big dreamy rock ballad. Shotgun Song is a mid tempo burner propelled by a bass line that has notes that hang in mid air like a sultry pause. It is a dream rock Mustang Sally but not quite. The degree to which you will love this EP, this tease of the full length album rumored to be called Future Runs Magnetic is whether you like this flavor of rock. It certainly feels purely wrought. It floats sublimely in that dream rock / pop ether. Drenik along with Eric Johnson (bass), Zach Richards (drums) and Evan Railton (synths) has made some captivating music with a wide eyed sense of wonder. When Future Runs Magnetic comes out I look forward to floating into it's pull.